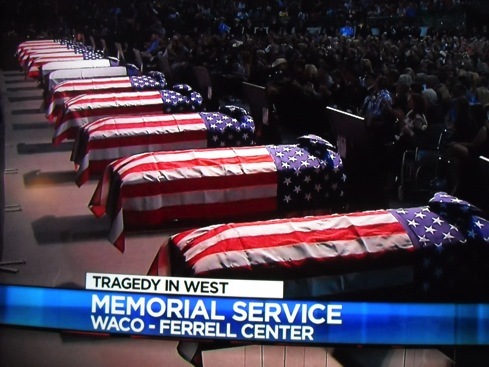 WFAA8’s decision not to join its D-FW rivals in continuous coverage of Thursday’s West, TX memorial service continues to prompt pointed responses from readers, via both email and Facebook. As previously posted, WFAA8 instead aired syndicated episodes of Anderson Live, Dr. Oz and Katie, breaking in only for President Obama’s remarks from 3:54 to 4:10 p.m. Fox4, NBC5 and CBS11 all preempted their regular programming to cover the more than two-and-a-half service from start to finish. WFAA8 news director Carolyn Mungo has not returned an email asking for an explanation of WFAA8’s editorial decision. All four stations offered wall-to-wall live coverage of Thursday morning’s dedication of the George W. Bush Presidential Center. WFAA8 has had subsequent investigative reports on the devastating fertilizer plant explosion, but wobbled again on Sunday’s 10 p.m. newscast. Newly hired anchor Carla Wade introduced a followup report on the small community by telling viewers, “In West tonight, the final victims of the bombings finally see their homes.” The station left the error intact for its post-midnight replay of the newscast. Wilson: You did the area a great disservice by not carrying the Waco Memorial until the President spoke. You did your news station reputation a huge disservice. WFAA8 representative Ann Clark: The full memorial service has been airing on WFAA 8.3, TXCN and streamed online at wfaa.com. Wilson: (Verizon) Fios does not carry TXCN and it does not carry any of the digital channels. I doubt that Dish, DirecTV or Time Warner carry the digital channels either. Your programming staff needs to take that into consideration when deciding what to broadcast . . . I am a Channel 8 fan. If I am going to watch news, 99% of the time my TV will be on Channel 8. I was really surprised when I discovered that you thought talk shows were more important than a tribute to Texas heroes.